President Donald Trump arrived Wednesday in North Carolina to see the destruction Hurricane Florence left behind and the challenging relief efforts that are underway. "The planning that went into this is beyond belief," Trump said shortly after arriving at the Marine Corps Air Station in Cherry Point, North Carolina." Trump told the victims "we're with you all the way." Officials across the state are cautioning residents that more floods are expected this week. North Carolina Governor Roy Cooper said 16 rivers were at major flood stage Tuesday with three more expected to peak by Thursday. Cooper told the president, "We're going to need your help" in the recovery efforts, to which Trump responded, "we will be there 100-percent." He sympathized with those who were forced to flee and are now relying on government-distributed bottled water and ready-to-eat field rations. 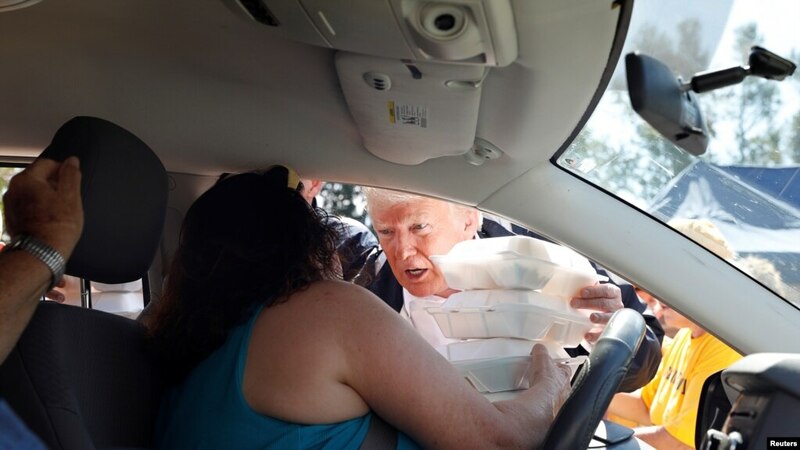 Trump said 1.6 million meals have been provided in North Carolina and another 400,000 are ready for victims in South Carolina.